This monster tape is a testimony of the mythical mongo tour which united MUSHROOM'S PATIENCE, DIAMANTENER OBERHOF, NIEDOWIERZANIE and TZII on the sinister road between Brussels, Mulhouse, Mainz and Würzburg. Those are not live recordings, but studio tracks made specially for this release. Mushroom's Patience is a cult experimental / surreal band from Roma formed in the early 80's. 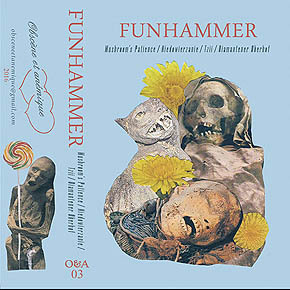 Diamantener Oberhof is the duo of Johannes Schebler (of Baldruin) and Christian Schoppik (of Brannten Schnüre) Niedowierzanie is a pathetic lament, originally from Marseille. Tzii, hailing from Brussels, has been spreading his cinematic, dark and weird music over the world since 1996. Expect nothing but surreal obsessions, bizarre folk, brainless mongo pop or dark cabaret musick. This tape is limited to 77 copies, with an artwork designed by Christian Schoppik and Johannes Schebler.